My name is MAX. Well, I must confess it really is Maxine but Elaine calls me MAX and I like that. I have been around for quite awhile but I just got promoted so you'll be seeing a lot more of me. I know why I was selected, too. I know everything that is going on! I will give you an example. When she arrives home, I know exactly where she has been because the first thing I do is sniff to see if she showed houses today. Elaine probably is not aware that I check on her but I make it my business to know those things. Sometimes I know she has shown a house where another dog lived. Fortunately she has not come home with another dog and that is good. There are other times when she has been at a house with CATS! Doesn't she know there are people that are allergic to cats? Now I am not allergic to cats, I just like to chase them. By the way she hasn't brought home a cat either, thank heavens. I want to tell you a little bit about me. Elaine said that I am a Rottweiler that has full papers. (Wonder what that means?) 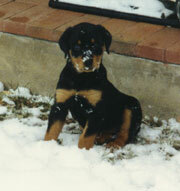 The history of Rottweilers goes back to Roman times. There is even a town in Germany that is named Rottweiler. Some of my ancestors were used by their owners to control the herds of cattle and protect their masters. Some of the stories tell about farmers tying their bags of gold around the necks of the Rottweilers to ensure the safety of their money. True or false we shall never know, but it has gone down as legend. One thing that is true is that I will live up to that legend and I will protect your valuable information and you can feel comfortable knowing that I am on duty. I know that is my puppy picture up above. There will be more pictures later but I learned, like most Realtors, we have to use the youngest photo possible. (Elaine did not update her photo for several years.) I haven't quite figured out why Realtors do that, do you know? Wouldn't it be better to look like yourself? Oh well, I am not the boss around here. When she is working with a Buyer, I know how important that is and so I get in the background and don't require much attention. She puts all of her attention to achieving the goal of finding the right house for the Buyer. I certainly do understand that because when she found me I am glad she was able to make the decision to let me live with her. That was a good choice for me and if I do say so myself, it was a good choice for her, too. Sport: I love to play hide and seek when I have to go look for someone. I usually find them, too. Place to nap: On the big sofa. Friends of mine: Taffy, Precious and Nicky. Nicky is my favorite because we can really play together. Another real friend of mine is Kimmy! I do not see her as often as I would like but I dream about her and remember all the fun times we have had when she visited. Elaine calls Kimmy her granddaughter but she seems to be just my age and we have a great time together. Here I am when I discovered snow. First I fell off the step and landed on my nose. That was a real shocker. The last time I was out there, it was green grass. I just do not know what happened. I would love to hear any adventures that you have had. If you have read about Carl, (book listed above) you know some of those adventures are secret. So if you tell me something that is secret, I will not tell anyone, o.k. !